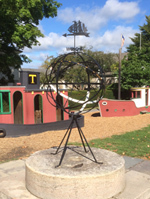 This large equatorial dial was created as part of a community effort to establish a Natural Habitat park for the town of Branford. The dial is 7 x 6 x 6 feet made of Stony Creek granite and stainless steel, weighing 13,000 pounds. The granite is indigenous to the town. The face of the stone is cut at approximately 41 degrees to match the site latitude, inspired by a design from Robert Adzema "The Great Sundial Cutout Book". Dial shows time from 7 am until 5 pm. Horizontal dial designed by Richard R. Bolster. Stone. "Mr. Bolster couldn't find dials to collect so he made his own collection." This upright stone was originally a noon marker at Nathaniel Taggart's inn in colonial North Blandford, MA. The stone was moved by Taggart's granddaughter Polly Taggart Church to Harland, CT, where she lived following her marriage. In 1935 the stone was set up in the Hartland Cemetery, casting its noon day shadow onto a flat stone with an engraved meridian line. Large slanted vertical dial on 8 ft. by 4 ft. wood rectangle mounted on a wall declining 80:50 east. Shows hours only till 11:30 AM, thus frequently called 'the morning dial'. Dial originally had no motto. 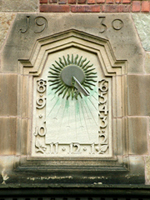 Inscription was added later when dial was refurbished. Designed by Albert Waugh and fabricated by Edwin Pugsley. Vertical 7 ft. diameter dial. Dial painted on circular piece of wood with Arabic numerals 6AM-7PM on wall declining 9:10 west. Mounted below peak of building. Smiling sun face at point where gnomon strikes dial plate. Designed by Albert Waugh and built by Edwin Pugsley. 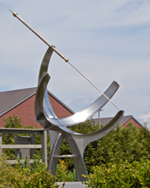 A 19 ft steel sculpture named 'Sheng'. Commissioned by the Connecticut Commission on the Arts in 1987 and designed by Robert Adzema. Basically a combination East and West direct dial with a circular gnomon. Large horizontal dial 17 ft. diameter with concrete gnomon 20 ft. high. Hour marks include longitude correction. Dial has a circular layout with a large sundial arm that sprays water on one side, a curved bench for sitting on the opposite side, a wading pool in between and a curved wall with three large oval holes cut out on one side. The sun shines through the wall onto the number of the sundial. A nearly 50 foot tall vertical concave cylindrical projection dial of precast concrete lined with aluminum panels and with an aluminum band projection gnomon. The curvilinear interior surface is inscribed with vertical hour lines and horizontal solstice and equinox marks. The band gnomon features a 2.5 inch diameter hole that projects an image of the sun on the silver-colored interior surface against a shadow cast by the gnomon band itself. A horizontal dial of striking modern design about 24 inches in diameter. The dial face is granite with milled wedges, leaving hour lines from 6 am to 6 pm. Hours are represented by small round bronze markers. The gnomon is of unusual design. When installed, the gnomon had a vertical glass plate below the style. The dial doubled as a fountain - water flowed from the top of the gnomon down the glass plate. Each of the bronze hour markers also had a small spray of water. The round granite dial is slightly smaller than the octagonal pedestal and base. A small trough between them recovers water from the fountain. The fountain is turned off during the winter. Judging by the mechanics of the fountain, it may to be turned on. The original glass plate has been replaced by a metal plate. The dial is part of a memorial installation called the "Ad Astra Garden" and was designed by an art professor at the college. A well-patinaed horizontal dial placed atop a stone column. Dial sits atop a cast aggregate column. An 18x18 inch square horizontal sundial with ornate engraving. Along the edge are Roman numerals telling the hours. The gnomon is equally ornate. Both dial plate and gnomon are made of brass. Dial sits on a tapered granite pedestal with a square granite cap. Equatorial dial about 5 ft. diameter made of brass and stainless steel The analemma is incorporated into the gnomon compensating for equation of time. Equatorial ring is rotated to compensate for difference in longitude to time zone. Designed and built by Physics/Astor Dept, University of Calgary, Alberta Canada. 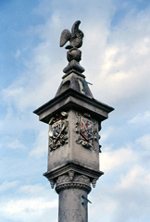 Dial sits atop a stone plinth marked with Keller's laws.